You can now place chimneys emitting smoke in your constructions. 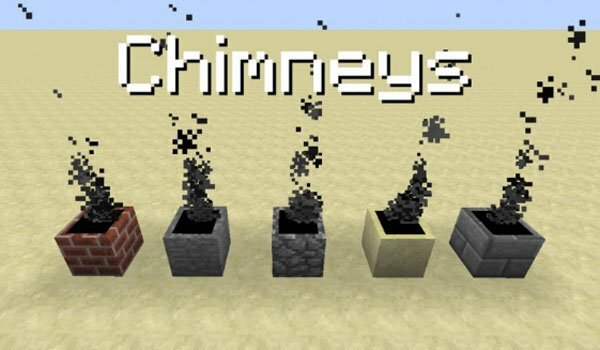 Chimneys 1.7.2 and 1.7.10 is a mod that lets you create chimneys using different materials. You will be alble to build fireplaces are: brick, stone (in its three variants) and sandstone. These chimneys will spread smoke particles out as long as the chimney blocks are glued or attached at the top or the back of a fire or a furnace. You can even mix the mentioned blocks to build the chimney, since it will still spread smoke, so the chimney does not necessary to be built with the same material. How to install Chimneys Mod for Minecraft 1.7.2 and 1.7.10? New fireplaces for decorate your home!